Dumfries Arms Hotel, 54 Glaisnock Street, Cumnock, KA18 1BY. This contemporary, stylish boutique hotel has a rich 300 year history behind it and boasts, amongst other colourful characters to have stayed within its walls, the national bard, Robert Burns and novelist Sir Walter Scott as past guests. 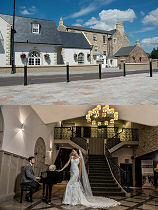 The old hotel has undergone a complete transformation and now boasts one of Ayrshire's largest and most stylish wedding venues along with 26 elegant bedrooms, a popular restaurant, a relaxed lounge bar and a private dining room. Guest rooms have been individually designed for comfort and elegance and include easy access rooms, family rooms, adjoining rooms and the ultimate luxury of the Lennox suite, with its separate lounge area, contemporary four poster bed and large en-suite bathroom with his and hers sinks, a separate shower cubicle and a Jacuzzi bath with its own TV. The relaxing hotel restaurant offers a unique dining experience with menus that will cater for all tastes and appetites. The lounge bar is a great place to unwind and 54 @ DA is the coolest cocktail and cafe venue in town. For weddings and functions, The Dumfries Arms Hotel can cater all the way from a small intimate gathering through to a lavish reception for up to 250. Open all year. B&B S from £89, D/T from £109. Rates are per room per night. Tel: 01290 429 230. Abbotsford Hotel 14 Corsehill Road, Ayr, KA7 2ST. STB 3 Star Small Hotel. The Arrandale Hotel 2-4 Cassillis Street, Ayr, KA7 1DW. Ayrshire & Galloway Hotel 1 Killoch Place, Ayr, KA7 2EA. STB 2 Star Hotel. Brig o' Doon House Hotel Alloway, Ayr, KA7 4PQ. 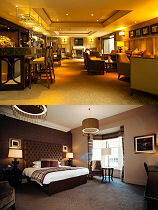 Brisbane House Hotel Esplanade, Largs, KA30 8NF. Burnhouse Manor Hotel Burnhouse, By Beith, KA15 1LJ. Carlton Hotel Prestwick 187 Ayr Road, Prestwick, KA9 1TP. STB 3 Star Hotel. Assisted wheelchair access. Carrick Lodge Hotel 46 Carrick Road, Ayr, KA7 2RE. STB 3 Star Small Hotel. The Chestnuts Hotel 52 Racecourse Road, Ayr, KA7 2UZ. STB 2 Star Small Hotel. Cochrane Inn 45 Main Road, Gatehead, KA2 0AP. Dalgarven Country House Hotel Dalry Road, Kilwinning, KA13 6PL. Awaiting STB Grading. Doonbrae House Hotel High Maybole Road, Alloway, KA7 4PQ. Ellisland House Hotel 19 Racecourse Road, Ayr, KA7 2TD. Enterkine Country House Annbank, By Ayr, KA6 5AL. STB 5 Star Small Hotel. Access for visitors with mobility difficulties. The Fairburn 12-14 Loudoun Street, Mauchline, KA5 5BU. STB 3 Star Small Hotel. Fairfield House Hotel Fairfield Road, Ayr, KA7 2AR. STB 4 Star Hotel. Access for visitors with mobility difficulties. The Fenwick Hotel A77 Ayr Road, Fenwick, Kilmarnock, KA3 6AU. STB 3 Star Hotel. The Gailes Hotel Marine Drive, Gailes, Irvine, KA11 5AE. STB 4 Star Hotel. Unassisted wheelchair access. Glenapp Castle Ballantrae, KA26 0NZ. STB 5 Gold Star Hotel. Read the Undiscovered Scotland hotel review for Glenapp Castle. Haylie Hotel 108 Irvine Road, Largs, KA30 8EY. Highgrove House Hotel Old Loans Road, Troon, KA10 7HL. Horizon Hotel & Restaurant Esplanade, Ayr, KA7 1DT. Hotel Kylestrome 11 Miller Road, Ayr, KA7 2AX. STB 3 Star Small Hotel. Kidron House 122 Main Street, Irvine, KA11 4EW. Lochgreen House Hotel Monktonhill Road, Southwood, Troon, KA10 7EN. Lochside House Hotel New Cumnock, KA18 4PN. STB 4 Star Hotel. Malin Court Hotel Turnberry, KA26 9PB. STB 3 Star Hotel. The Marine Hotel Crosbie Road, Troon, KA10 6HE. Manor Park Hotel 48 Kilmarnock Road, Monkton, KA9 2RJ. Menzies Irvine Hotel 46 Annick Road, Irvine, KA11 4LD. AA 4 Star Hotel. The Park Hotel Rugby Park, Kilmarnock, KA1 2DP. STB 4 Star Hotel. Parkstone Hotel 6-8 Ardayre Road, Prestwick, KA9 1QN. STB 3 Star Hotel. Assisted wheelchair access. Piersland House Hotel 15 Craigend Road, Troon, KA10 6HD. STB 4 Star Hotel. Access for visitors with mobility difficulties. Queens Hotel 1 Montgomerie Street, Girvan, KA26 9HE. The Royal Hotel 1 Glaisnock Street, Cumnock, KA18 1BP. STB 3 Star Small Hotel. The Royal Hotel 36 Montgomery Street, Girvan, KA26 9HE. Savoy Park Hotel 16 Racecourse Road, Ayr, KA7 2UT. STB 3 Star Small Hotel. Seamill Hydro 39 Ardrossan Road, Seamill, KA23 9NB. STB 3 Star Hotel. Souters Inn 47 Main Road, Kirkoswald, KA19 8HY. South Beach Hotel 73 South Beach, Troon, KA10 6EG. STB 3 Star Hotel. Assisted wheelchair access. The Southfield Hotel & Restaurant The Avenue, Girvan, KA26 9DS. STB 2 Star Small Hotel. The Stair Inn Stair, by Mauchline, KA5 5HW. Travelodge Ayr Highfield Drive, Ayr, KA8 9SH. Westcliffe Hotel 15-17 Louisa Drive, Girvan, KA26 9AH. STB 2 Star Hotel. Western House Hotel 2 Craigie Road, Ayr, KA8 0HA. STB 4 Gold Star Hotel. Assisted wheelchair access. The Woodhouse Hotel 2 Barr Crescent, Largs, KA30 8PX.